HSF1 from other species may also be detectable. Stability :Store at 4oC (add 0.1% NaN3) for several months, and at -20oC for longer periods. For optimal storage, aliquot target into smaller quantities after centrifugation and store at recommended temperature. For optimal performance, avoid repeated handling and multiple freeze/thaw cycles. 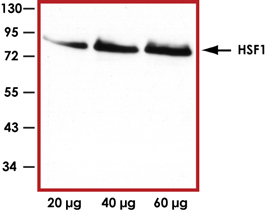 Sample Data :Representative Western blot with Anti-HSF1 (1:500) using 40ng of GST-tagged human recombinant HSF1. Sample Data :Representative Western blot with Anti-HSF1 (1:1000) using 20 μg, 40 μg and 60 μg of 293 cell lysate. Scientific Background :HSF1 is a member of the heat shock transcription factor family. Protein-damaging stress lead to the activation of HSF1 which binds to upstream regulatory sequences in the promoters of heat shock genes leading to enhanced heat shock gene expression (1). The activation of HSF1 proceeds through a multi-step pathway, involving a monomer-to-trimer transition, nuclear accumulation and extensive posttranslational modifications. HSF1 activity is regulated at different levels by heat shock proteins and co-chaperones and is modulated further by a number of mechanisms involving other stress-regulated aspects of cell metabolism (2). 1. Pirkkala, L. et al: Roles of the heat shock transcription factors in regulation of the heat shock response and beyond. FASEB J. 2001 May; 15 (7):1118-31. 2. Voellmy, R.: Feedback regulation of the heat shock response. Handb Exp Pharmacol. 2006 ; (172):43-68.